…….not that many people are so dependent on the mask that they can’t take it off briefly. However, when we do need it has been fantastic. In the latest patient we used it with it was a “God send”. We needed to have some very in-depth discussions with the patient and she with her family about her wishes prior to us anaesthetising her. She was able to communicate everything she needed to and make decisions on her own behalf and speak with her family. She died a few days after that and the nurses caring for her said how great it was to get all that dialogue going and it made decision-making so much easier in the end. So that is how it is going. Fantastically. 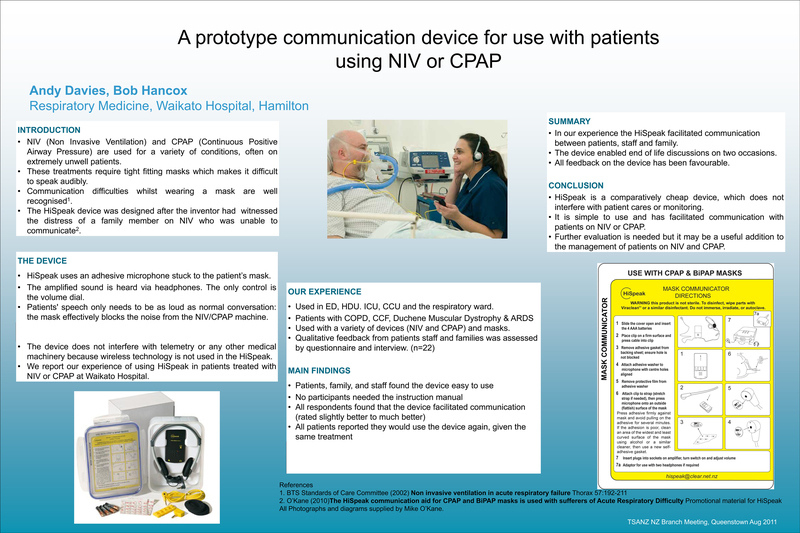 I used the HiSpeak system with a patient here at the Otago community Hospice who has Duchene’s Muscular Dystrophy and uses a bi-pap full face mask. The HiSpeak was helpful for the nurses to begin to understand this patient. Further, the counsellor, who met with the patient two times found it to be extremely helpful. She felt she could be respectful of distances (not intruding into his personal space) and with the help of the earphones hear his concerns. After our trial period, we purchased the HiSpeak so we have it available whenever the need arises.